30 years after the first Blade Runner hit theaters, it looks like Harrison Ford may return in the sequel. Prometheus isn't the only return to sci-fi roots for director Ridley Scott. The man is also going to helm a new movie set in the same universe as the 1982 classic Blade Runner. Unsurprisingly, rumors are starting to fly about whether or not Harrison Ford will return as the character Rick Deckard; right now, word has it that Mr. Solo is currently in negotiations to join the film. Twitch is reporting that Ford has "entered into early talks" to sign onto the new Blade Runner movie. Scott himself has gone on record to say that the film will be a kind of sequel, albeit one without any of the original cast; this has led a lot of people to speculate on whether or not the movie will be more a reboot for the brand. If Ford's actually a potential cast member, though, the entire project is cast in an entirely different light. The problem with this report is that details are still few and far between. Ford may be in negotiations to reprise his role as Deckard, but there's no word on how big his role will be. For all we know - provided the story about these negotiations is true - Deckard might have a fully-fleshed out part in the movie's story, or his appearance may be little more than a cameo (like, say, a certain furry Canadian had in X-Men: First Class). Even though Scott's attached to the movie and Ford's apparently in negotiations, it's not evident whether or not the film's going to make its proposed 2014 release date. I guess we'll just have to wait for an official announcement before this rumor can be confirmed or denied. 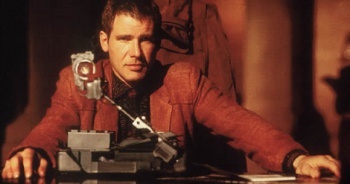 Oh, and before the forum arguing begins: Deckard's a replicant.